One key part of the problem is capturing the output from the rotary encoder such that it is reliable, accurate and doesn't consume too much resource. While pulse counting was key, I didn't need to track the phasing as I already know which way the motor is turning, this means all I need to do is detect and count edges. Pigpio's tally capability - part of the callback function - does exactly this and should provide accurate counting up to at least 50,000Hz pulses which is a good margin above what I expect to need (10,000 rpm, 3 pulses per rev). My control loop can then read this counter 20 times (or thereabouts) per second and any minor jitter will not result in lost pulses - merely some jitter in the feedback which should correct itself next time around the loop. I found early on that at high frequencies meant that the motor would not move at all until quite high duty cycles were used - and consequently quite fast motor speeds. At very low pulse frequencies, low duty cycles - and low rpm - could be achieved, but the motion even through a fairly big reduction ratio gearbox was noticably jerky. 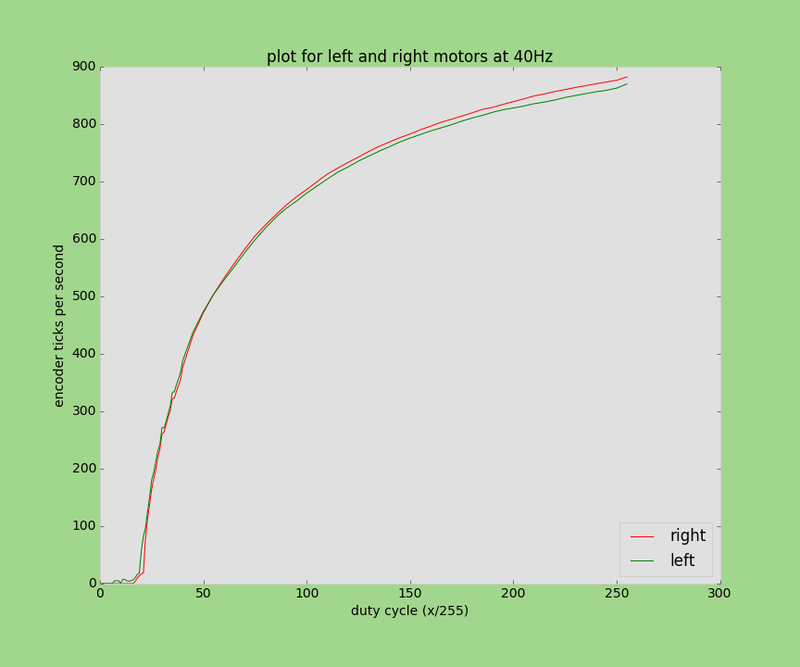 The motor controller therefore provides low level methods to set both the frequency and duty cycle used to drive the motor. 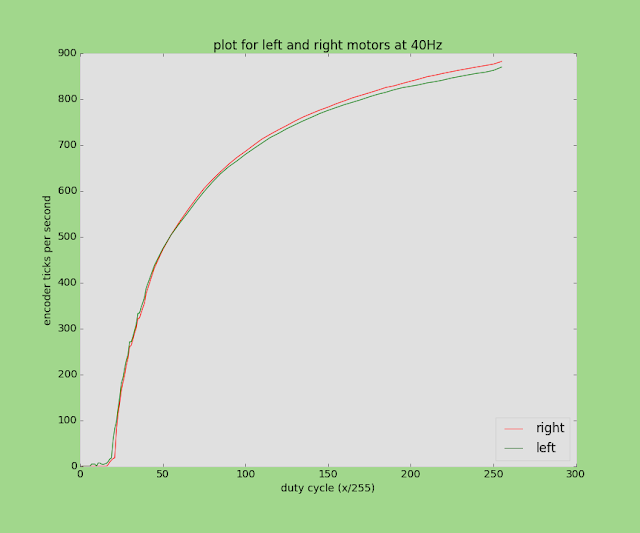 DC motors usually provide a very non-linear response to increasing pulse width - in fact the curve is pretty much asymptotic. This means that at low %age duty cycles a small increase gives a huge increase in speed, whereas at high %ages there is hardly any change. This became a particular problem when I started on the PID feedback control as the PID settings that worked at around 700 ticks per second were hopeless at 200 ticks per second and vice-versa. 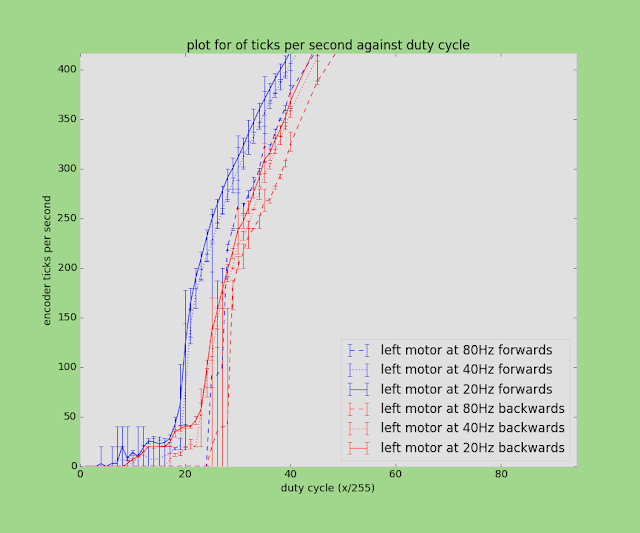 This plot shows the response of a single motor with error bars showing the results of several runs at each setting of duty cycle and pulse frequency.